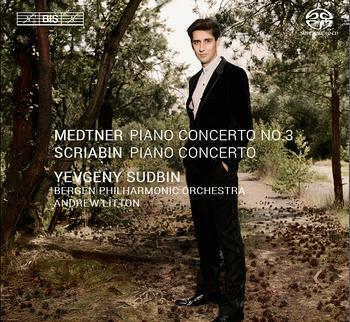 Sudbin’s recordings of Medtner’s first and second piano concertos (BIS1588 and BIS1728) were widely admired, with the first disc nominated for a Gramophone Award and the second being dubbed an “Essential Recording” in BBC Music Magazine. His recordings of Scriabin have similarly garnered universal acclaim. The liner notes, written by Sudbin, state with conviction that both concertos are “absolute masterworks – unjustly underperformed and constantly underappreciated”. With great empathy for, and insights into each composer. Yevgeny Sudbin takes on the great challenges – musical as well as technical – posed by the two works, with the eminent support of the Bergen Philharmonic and their chief conductor Andrew Litton.